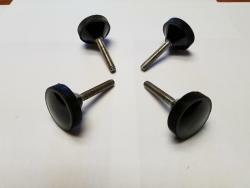 This is a set of four replacement Large Black Nylon Knobs. The replacement knob measures 1/4"-20 x 1-1/4". Fits all Stainless Steel and Die Cast Boat top hardware using 1/4"-20. This is for a quantity of 4 replacement knobs.